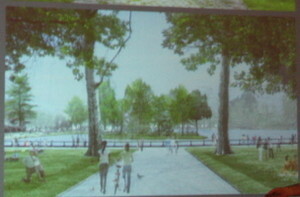 The Lakeside Center will rise on the current Wollman Rink parking lot, while the old rink will be turned back into lake and shore, with a reconstructed island (for "habitat," not musical performances). This will be the view from near the statue of Lincoln, who now stares sadly at the Zamboni storage shed. Olmsted and Vaux will like this part. This, maybe not so much. 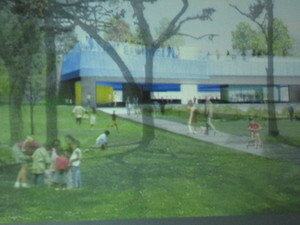 The new building will lie beneath a sloping "green roof" rising from the current picnic area into a tree-studded promenade. 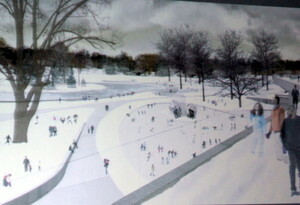 Beneath it will be two layers: a sort of mezzanine, and a sheltered hockey rink, with a recreational skating rink laid out in front and connected by an ice pathway. Here, the center looks like a particularly pastoral Ikea. Here's the view from the top, looking over the outdoor rink and the lake beyond. 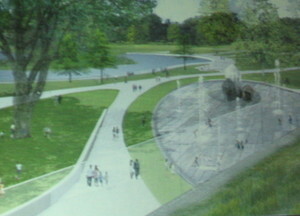 In summer, some fanciful water feature may take the place of the outdoor rink. 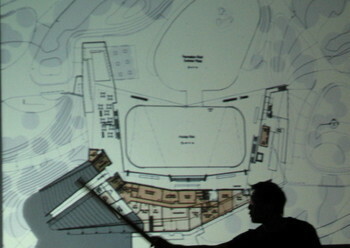 This overhead diagram shows the hockey rink (rounded rectangle in the middle) and open-air rink (above it). 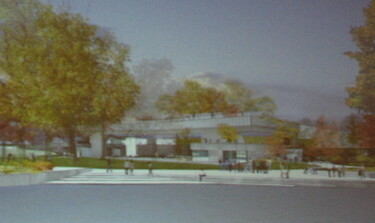 The gray part is the ramp-like "green roof" and the left flank of the building would hold an expanded cafe. None of this is finalized, said Ms. Thomas; many review stages lie ahead (along with fundraising for the staggering anticipated price tag of $75 million), and they seem genuinely interested in soliciting community feedback. Tonight's small crowd was generally positive and enthusiastic, although a representative from a figure-skating club objected to the placement of a rock outcropping in the middle of the recreational rink. There are two things I really hate in life: change, and hockey. No, make that three things: change, hockey, and modern architecture. So I am not the most receptive audience for this grand vision. The new building aims for integration into the landscape, but it's a jarring addition to the original Olmsted/Vaux style of Victorian rustic folly, and the subsequent overlay of neo-Classical splendor. If it were up to me, I would probably go for a meticulous recreation of the grove's genteel and vanished past, designed like a movie set of Edith Wharton's New York. I would recreate the long-gone "Dairy" down to the menu (oysters, anyone?) and hold costumed skating evenings and summertime musicales with Gilbert & Sullivan and Sousa marches. All the revolting little boys could go and play hockey somewhere else, and the architects could give us mullioned windows and dreamy spires instead of hunkering cantilevered decks with LEED certification. All of which makes me realize that "my" Prospect Park is more about escapism than I realized—not just escape from the city but from this irksome new century. With completion not anticipated until 2011, I have some time to get used to it. The best part of the evening came after the meeting broke up, when I got a chance to chat with some nice Prospect Park people and AYITP readers, including the bubbly and indomitable Ms. Thomas, and then bicycled home through the park after dark for the first time. It was summery and peaceful at almost 9 p.m., with plenty of joggers for company; I felt at once very safe and very brave. No disrespect meant to "green," er, I mean green roofs; but it is a neologism that remains relatively unfamiliar to non-archi-wonks, and is not literally a green-painted conventional roof, so the quotation marks serve to acknowledge all that for a general audience. Or at least that's how I'd call it while wearing my editor hat.